I had the delight of bringing a quintet (string quartet plus bass) to the wedding of Erin and Andrew which took place November 16 at the Wren’s Nest outside of Murfreesboro. Their ceremony was very touching with self-written vows and a lot of joyful tears. Friend, Michael, set the stage after prelude with hymns that the guests joined in singing. Then we began processionals, a mix of traditional and contemporary with mothers entering to Bach’s “Air” from the Suite in D and the attendants to the beloved “Canon in D”. Erin chose to enter to “1000 Years” which was tailored to she would arrive at the altar to the chorus (“I love you for a thousand more (years)). Very sweet. During the service we accompanied Heather, Erin’s sister-in-law, as she sang “Holy Wedding Day” during communion. Heather is a wonderful singer and it was truly our pleasure to accompany her. After the presentation of the newly married couple we sent them off to the reception to U2’s “Beautiful Day”. When I learned that was the tune she wanted, I at first thought she wanted a Michael Buble tune by the same title that is a break-up song…which I was prepared to talk her out of. Silver Strings reconvened in the reception area to kick up the energy of the cocktail hour with some rock and roll which was especially fun for us because we had a bass for a change. Heather, our singer, told us her little girls were mesmerized by what we were doing. I’ll take that as a compliment. 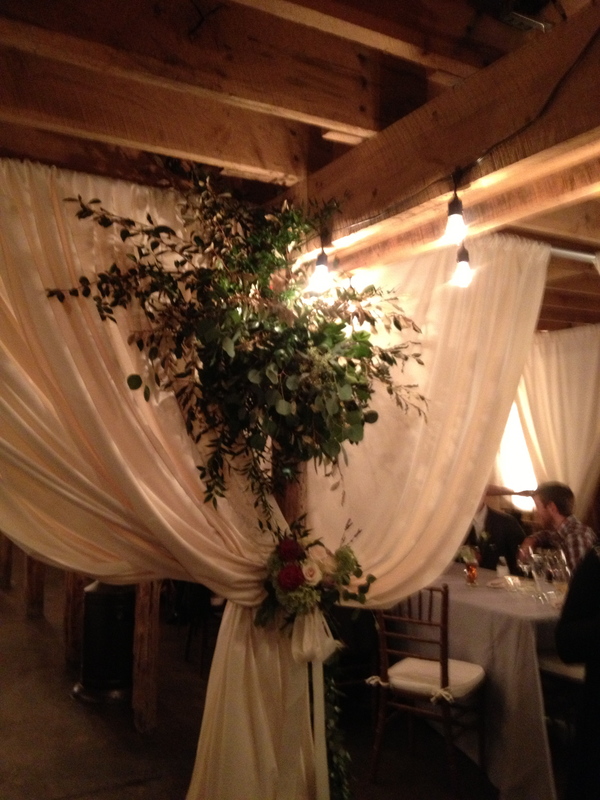 The Wren’s Nest is a relatively new venue tucked away west of Murfreesboro off the beaten path. 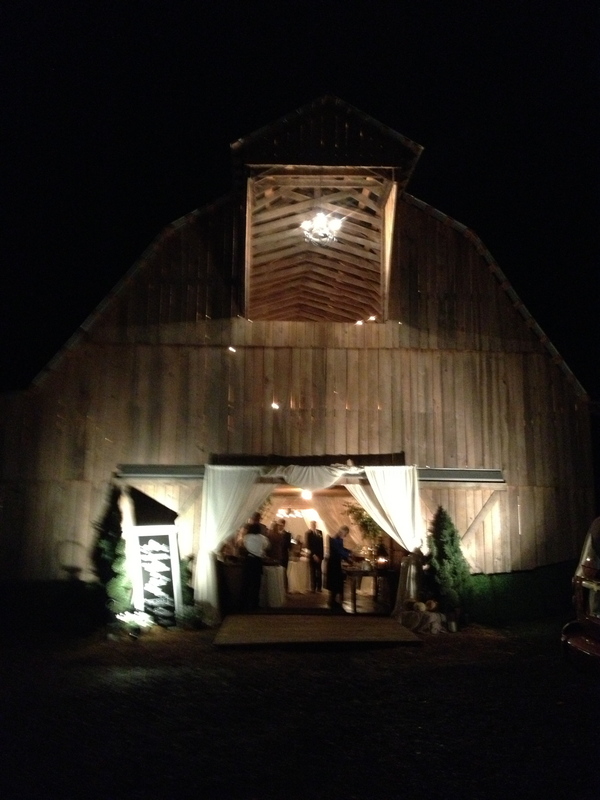 It is a delightful barn with a chapel in the loft and room for the reception on the main floor for those who want to create a more rustic feel for their weddings. 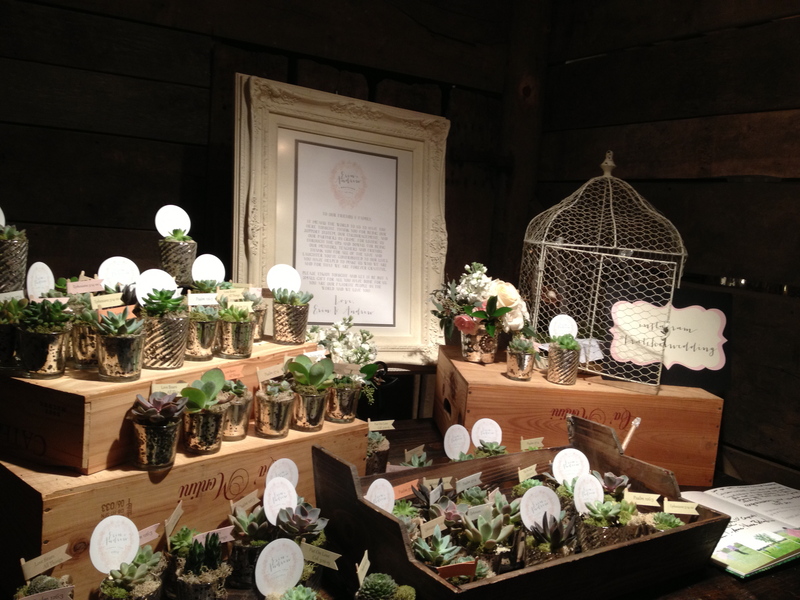 And lastly I want to brag on Lauren Hartman of Southern Soiree, for pulling this wedding and reception together and keeping each part of the event flowing smoothly. And brag some more on Michael and Heather for the great jobs they did lending their voices to this wonderful occasion. And as always congratulations to Erin and Andrew and their families and a wish for many happy years together. As I mentioned before, the first weekend in November was a busy one. 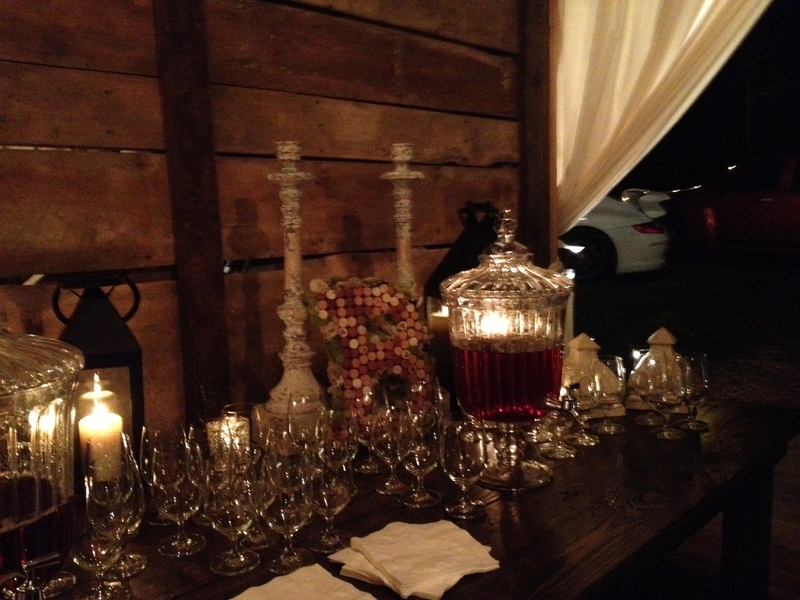 We got to experience a new venue that opened recently…Mint Springs Farm outside of Nolensville. It turned out to be a beautiful, picturesque place with a quaint ceremony pavilion sporting old-timey looking pews. In this lovely venue Rebecca and Ryan blended their families in a very touching ceremony that included their children and parents in the ceremony. We played more rock tunes for the cocktail hour including Lady Gaga’s “Poker Face” which people couldn’t believe was being covered by a string trio. And congratulations go to Rebecca, Ryan and their kids as they begin a new phase of life together. The first weekend in November was indeed a busy one for us. 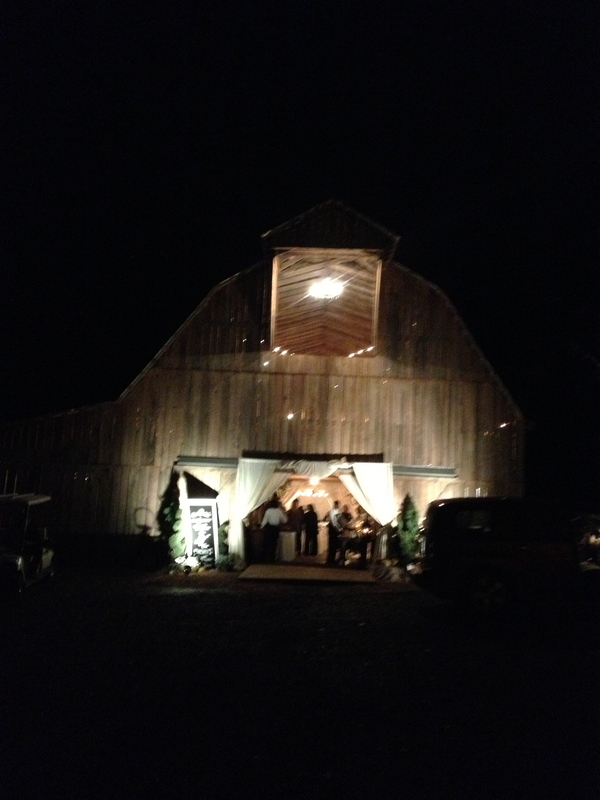 Luke and Rebecca got married at Front Porch Farms in a very fun, relaxed ceremony on November 2. We rocked out with selections like Elton John’s “Your Song” and the Beach Boys’ “God Only Knows” for the prelude. As per Becca’s wishes we straightened up and played traditional selections for the processionals including “Jesu” for the mothers and wedding party, “Canon in D” for Becca and Mendelssohn’s “Wedding March” for the recessional. While I’ve never really had a “Bridezilla”, these kids were incredibly easy to please and a joy to work with. It didn’t hurt that the weather was stunningly beautiful (although a little breezy) and the panoramic view from Front Porch Farms was gorgeous. After the ceremony we performed for a cocktail hour, again reaching back to classic rock selections such as “Billie Jean” and “Signed, Sealed, Delivered”. Kathy Best, the owner of Front Porch Farms, does a terrific job of directing the action and making sure all the different aspects of a wedding and reception run smoothly. As always, congratulations to Luke and Becca and their families. 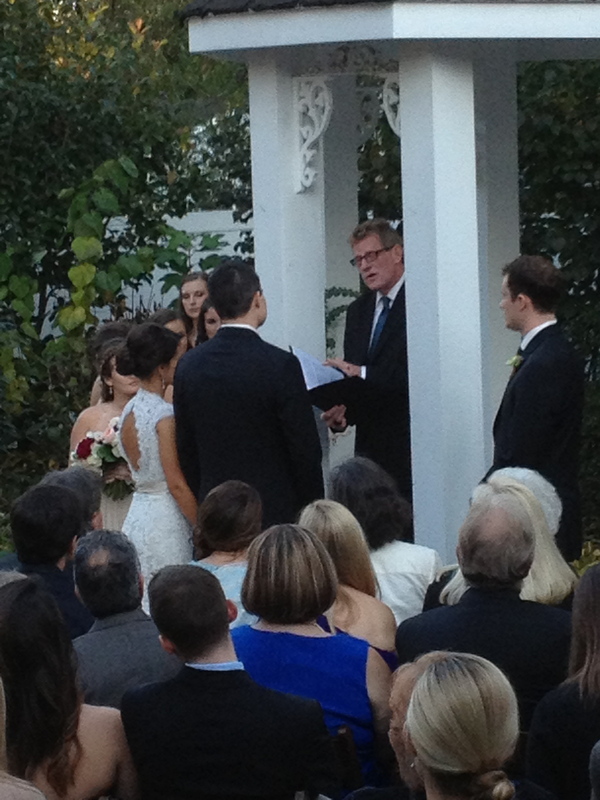 Meanwhile back at CJ’s we presided over the music for Jenna and Alex on November 11, 2013. We started off the processionals with the lovely “Dawn” from Pride and Prejudice for the mothers and grandmothers, moving to “Canon in D” for the wedding party. Jenna chose the not-so-often used “Prelude to Te Deum” by Charpentier. No, it’s not pronounced “tedium” and it certainly is a dignified selection fitting of the entrance of a bride. They did however choose the Beatles’ “All You Need Is Love” for their exit to signal that the fun was about to begin. Congratulations to the two of them and their families. October 19 found us freezing our fannies off at CJ’s Off the Square (don’t worry, they grew back while we slept). I’m sure the bride didn’t notice the cold at all being so excited, as brides are, to finally be married. At CJ’s the weddings always come off smoothly with the only hitch being that of the couple as they were pronounced husband and wife. Danielle and Jonathan chose an eclectic mix of songs including the Brandenburg Concerto #3 for the family, “Jesu, Joy of Man’s Desiring” for the wedding party and finally the beautiful “Canon in D” for Jenna’s entrance. The the fun began with the exit to Muse “Starlight”. Jocelyn, the violinist that day, brought her young daughter who delighted us with a song before we began prelude (I can’t remember which one right now), singing with a clear, sure voice that made everyone in the vicinity stop and listen. As they say apples don’t fall too far from the tree. Congratulations to Danielle and Jonathan and their families. May they have a long and happy life together.